Fungus gnats can be a serious pest in greenhouses where they can damage the roots of plants. They also feed on fungi and decaying plant material. For more information about fungus gnats as pests of ornamentals, consult Darkwinged Fungus Gnats. Occasionally, fungus gnats become a nuisance indoors in both residential and commercial buildings when adults emerge in large numbers from potted plants or some other chronic source of moisture (and subsequent mold growth). Adults are attracted to lights and are often first noticed at windows or light fixtures. Adult fungus gnats are about 1⁄10 to 1⁄8 inch long, slender, somewhat mosquito-like, with dark-colored antennae and delicate with long legs. Some species are gray to black in color, while others are orange-to-yellowish in color. 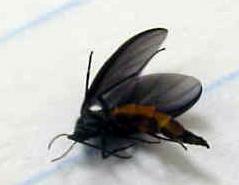 Identification can be made by the vein patterns in the single pair of wings, which may be smoke-colored or light in color. One of the most common species, the darkwinged fungus gnat adults has eyes that meet above the base of the antennae. The eggs are extremely small, oval, smooth, shiny white and semi-transparent. 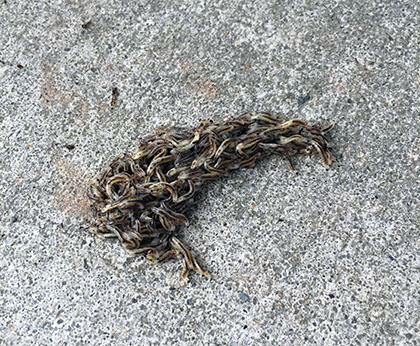 Larvae or maggots are legless, thread-like, white, with black heads and 1⁄4 inch long fully-grown. They are somewhat transparent so food in their guts can be seen through the body wall. The larvae spin silk-like cocoons in which they form pupae. Figure 2 - Fungus gnat "snake" - larvae moving together from very wet conditions. The key to solving indoor fungus gnat problems is to find and eliminate the source, i.e., find the area(s) of excess moisture. If the problem is seasonal, i.e., it declines or totally disappears in the fall/winter, then quite possibly the source is outdoors. The most likely problem spots are landscaped and/or heavily mulched areas or lowlying areas in the yard that remain extremely wet following heavy rainfall, overwatering, or a leaking outdoor water spigot (Figure 3). Correcting the problem may be a matter of repairing a leak or correcting drainage problems in that area (e.g., grading and/or contouring the area or using gravel to allow water to drain properly). If the problem is relatively constant regardless of the time of year, then the source is more likely to be originating indoors or at least it is associated directly with the building rather than an outside (landscaped) source. 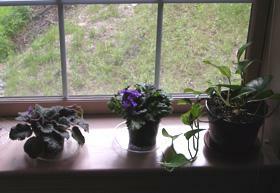 Potted plants and other types of interiorscaping are often the culprits (Figure 4). Check plants to see if the soil is excessively wet. Drain any excess water from the dish/container below flower pots. If the weather permits, move the plants outdoors or allow the soil to dry (not to the point where plants will wilt). Then, simply add a day (or more) between regular watering and the problem should decline. 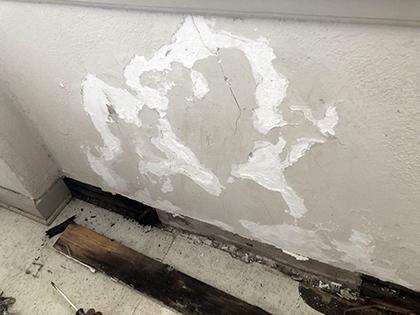 Check other areas where leaks may occur as a result of storm damage or poor maintenance, e.g., roofs, crawlspaces, and walls and floors near exterior wallsss (Figure 5). This is particularly important on commercial buildings with flat membrane-covered roofs. Water leaking through a break in the roof (whether caused by damage or improper sealing) will result in the underlying insulation becoming wet and possibly moldy creating an ideal habitat for fungus gnats. Inspect the roof and ceiling below for signs of leaks. Try to determine what areas of the building have the highest numbers of gnats. Check window ledges, light fixtures, etc. Fungus gnats are mobile and are more likely to move towards a nearby source of light. Pest control companies use Insect light traps to help determine which areas are most heavily infested. Adult fungus gnats are killed easily with pyrethrins spray or aerosols labeled for use against "gnats" or "flying insects." However, these chemicals are a very short-term and very temporary solution. Unless you can access and treat the source then, once the chemical dissipates, more flies are likely to appear. Similarly, treating outdoor areas may produce mixed results particularly if you cannot identify the key areas that are infested with fungus gnats. Indoor plants or interiorscaping that is difficult to remove can be treated with a number of pesticides that are listed in the North Carolina Agricultural Chemicals Manual. Among the less hazardous products available to consumers are those containing Bacillus thuringiensis var. israelensis (Gnatrol, Vectobac). 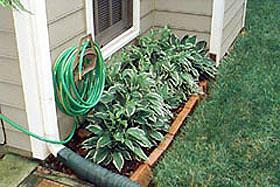 These products can be applied as soil drenches to potted plants indoors or to outdoor areas. Outdoor landscaped areas can also be treated with beneficial nematodes. Regardless of how "safe" you consider any pesticide or insect control product, always read the label and follow directions and safety precautions. Figure 3. Landscaped areas that hold moisture can be breeding grounds for fungus gnats.